Veterans and a York Township trustee are outraged after a monument at the Gold Star Family Memorial on Norwalk Road was vandalized. 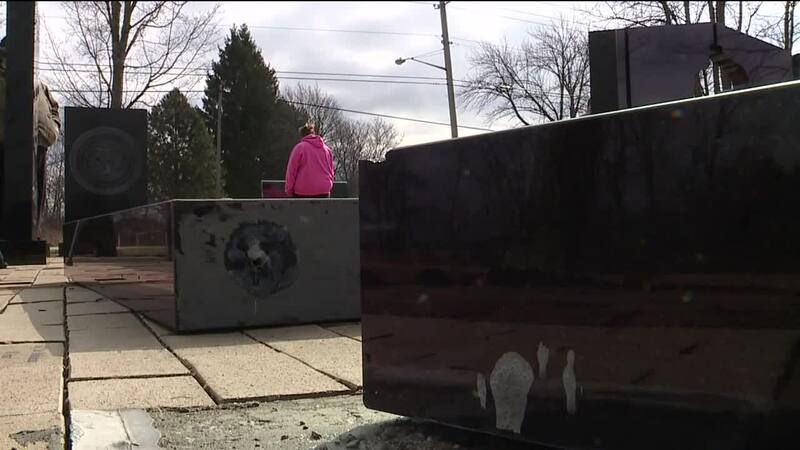 YORK TOWNSHIP, Ohio — Veterans and a York Township trustee are outraged after a monument at the Gold Star Family Memorial on Norwalk Road was vandalized. Deputies were called to the park around 5:30 p.m. Wednesday. Unknown vandals knocked over a 6-foot-tall black marble Army monument leaving it cracked and chipped, while also damaging brick pavers. Monuments representing other branches of the military were not vandalized. Trustee Richard Monroe said the memorial was dedicated three years ago and is a source of pride in the township. He said it’s the largest memorial of its kind in the United States. Other Gold Star Family Memorials have been built in 40 other states. "It's all about the veterans here. It's about the families that lost loved ones in the service," Monroe said. "This is disheartening. It's very disturbing to see the damage that was done. You hope that they'll come forth and admit what they've done and try to make restitution somehow." Norm Hinman, an 87-year-old Air Force Veteran, was outraged by the desecration at a site he believes should be solemn. "It's devastating. It shouldn't happen. I don't know why somebody would do that," Hinman said. Investigators don't have any suspects and were not able to recover any fingerprints, according to a police report. The monument is too heavy to lift. Township officials plan to bring in a crane to upright it. Monroe said $140,000 in community donations paid for the entire project. He estimated the damage to the toppled monument will be "in the thousands." "Townships are strapped for cash, and at this time, we don't have the funds to repair this. We really don't. Hopefully, someone comes forward to help us out somehow someway," Monroe said. Anyone with information on the vandalism case is asked to call the Medina County Sheriff's Office at 330-725-6631.